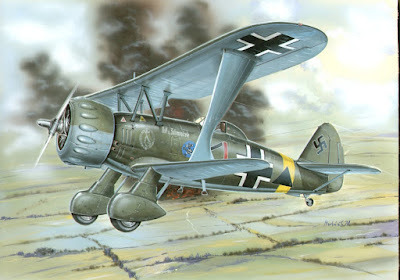 In 1934 the decision was taken that Germany required a dive-bomber to support the army’s land operations. The planning called for a two-step approach, the principal aim of the first orders being to initiate aircraft that could be produced quickly. The design for these machines was to be of as an advanced a type as possible, but, conversely, had to be produced quickly to meet deadlines. 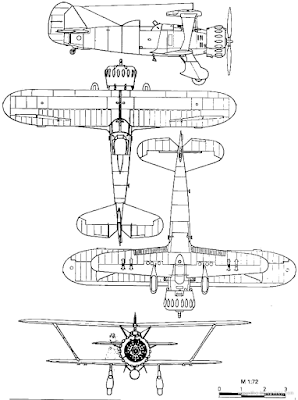 Thus the new aircraft was to be a biplane until more advanced monoplane types in the pipeline could be readied. In reality the plane was viewed as a stop-gap machine between the existing Heinkel He.50s, which were already recognized as inadequate for all-out dive-bombing, and the arrival of the ‘heavy’ monoplane dive-bomber, which both Heinkel and Junkers were busy experimenting with. 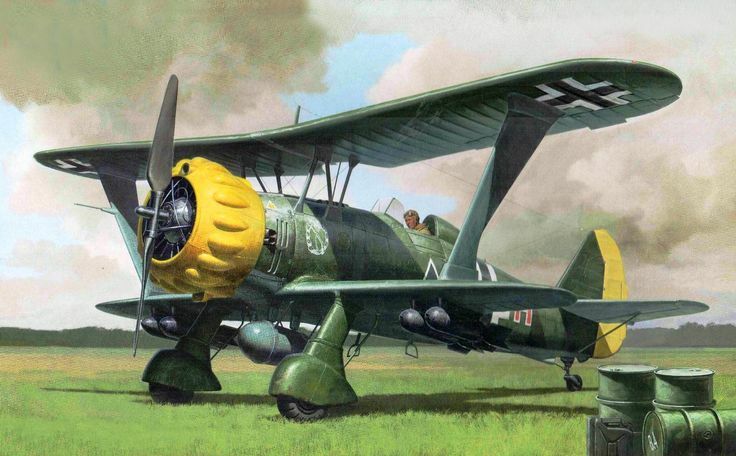 The two main contenders for the new aircraft were Fieseler and Henschel Flugzeug Werke A.G. Both companies utilized the 725hp (541kW) BMW 132A-3, 9-cylinder, air-cooled radial engine to power their initial prototype machines, but there the similarities abruptly ended. 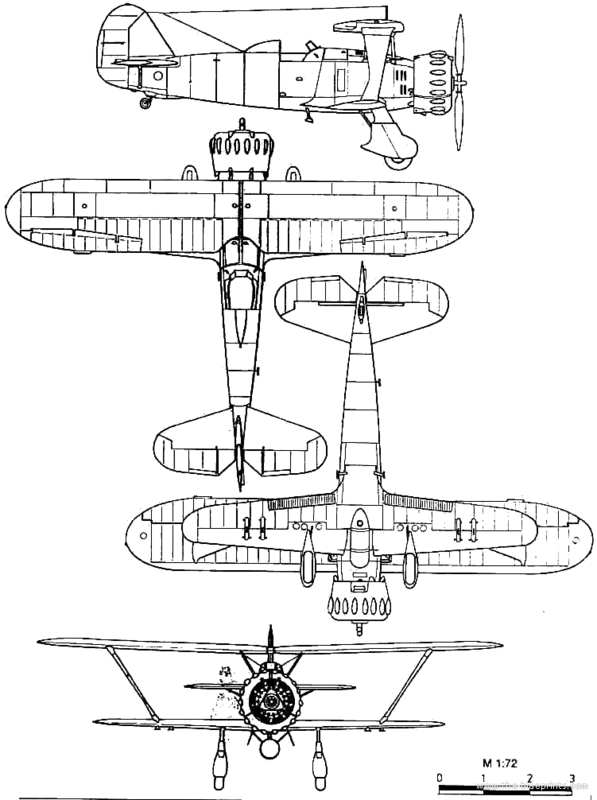 The Fieseler offering, the Fi.98 biplane, proved little or no advance on what had gone before, with a mass of wires and strut bracings to support the wing cellule. The Fieseler just didn’t ‘look right’ and her performance during trials re-emphasized the old adage, that if it didn’t look right it wouldn’t fly right, and nor did she. In stark contrast the Henschel design was of a clean and groundbreaking appearance. Instead of a maze of wire rigging, most of her loading was taken by a pair of hefty, outwardly canted, struts. She had the wide-chord NACA-type engine cowling and presented a much more workmanlike appearance. Right from the start the Henschel outclassed and out-performed its rival and it was clear that Oskar Robert Henschel and his construction team, under Dipl. Ing. Friedrich Nicolaus, had created a little gem of a plane. The first Versuchsflugzeug (V-1 – Prototype) machine (Werke No. 265, V-1, civil registration D-ILUA) powered by a 725hp BMW 132A 9-cylinder radial engine1 driving a three-bladed propeller, made her maiden flight without any armament aboard, at Johannisthal, Berlin, on 8 May 1935. On 8 May the same year she was exhibited to the Luftwaffe top brass, including Ernst Udet, at Johannisthal airfield near the capital, prior to being transferred to the Test Centre at Rechlin. It was here that the gun armament of two MG-17s along with their associated synchronising equipment and 500rpg (rounds per gun), were installed in the upper segment of the engine cowling. The V-2 (Werke No. 266; apparently, she was never allocated any civilian registration letters), appeared in May 1935 and began flight-testing in the following month, among the test pilots being a certain Major Robert Ritter von Greim, later, as a Generalfeldmarschall (Field Marshal) destined to be the last commander of the Luftwaffe. She was fitted with a 770hp Wright Cyclone GR-1820-F 52 engine, with a narrow, short-chord cowling featuring eighteen valve fairings. This engine drove a three-bladed, adjustable-pitch, propeller. She went to the Erkprobungsbeginn dei de E-Stelle at Rechlin in June 1936 to be assessed, but she was subsequently damaged in a ground-loop at Schönefeld Field, Berlin, in August. Reliance on any foreign-built equipment was deemed unwise so, on re-building in early 1937, at a cost of RM 12,458, she was altered to become the V-8 and, in this guise, featured a 725hp BMW 132A-3 driving a three-bladed propeller. She then received the civilian registration D-IUPO and was allocated to the RLM’s Luftzeugamt (Office of Aviation Equipment) in Kölleda, Thuringia, north of Weimar. While with the E-Stelle in Erprobung she was allocated the new Werke No. 670, which has caused confusion ever since! The V-3 (Werke No. 267, D-IKOU) also arrived in May 1935 and was also sent to Rechlin where she was tested between July 1935 and August 1936. She had the same power plant but driving a two-bladed, variable-pitch, propeller. In May 1936 she was personally flown by Oberst Ernst Udet. She was used as the test aircraft for a new type of flexible fuel tank designed to expand to fill available space inside the aircraft instead of a fixed dimension metal tank, and thus offer a greater range of design options. This was to become part of the Ju.87’s make-up. Also tested was the So 1 II-Würfe underwing bomb-release apparatus and also trialled was the Revi IIIb reflex sight and the Kronprinz AG spornrad (tail-wheel) in place of a skid. After damage in an accident and repairs, the aircraft returned to Rechlin where, on 1 April 1937, it crashed while pulling out of a dive, killing Flugzeughbau GmbH test pilot Heinz Wulf. The V-4 (Werke No. 266, D-IZXY) was not completed until April 1936, even though it had the same engine installed, due to being chosen by the RLM as the lead aircraft for the A-0 pre-production batch. After the acceptance tests at Schönefeld she went to Rechlin in September 1936 and was used for various bomb container trials. Under the So II package, she had a range of ten vertically mounted Elvemag 5C 10 bomb tubes, in two banks of five, each tube containing an Sprengbombe-Cylindrisch 10 (S.C.10) 25lb (12kg) fragmentation bomb, with small steel pellets impeded in concrete, inserted into her fuselage. Testing tended to show that such small weapons, delivered vertically, were capable of accurate delivery onto a target but that the ground access to re-load these tubes on such a small aircraft was very restricted and not practical for any rapid re-arming turn-around in the field and Tech-amt shelved the whole project (although they were to later be subject to widespread use during the war in modified form). Instead, the So III package was chosen, with a simpler under-lower-wing rack carrying two 110lb (50kg) bombs adopted. The V-5 (Werke No. 796, D-INRA) had the 830hp (619kW) BMW 132G engine driving a three-bladed propeller when first completed in March 1936, being the sixteenth A-1 production aircraft. The machine was then due to be equipped with the 830hp (619 kW) BMW 132G radial, but, once again, before this could be implemented this change was dropped and she then appeared at the 4th International Aviation Meeting at Dübendorf, Switzerland, flown by test pilot Othmar Schürfeld, with the 910hp (678.58 kW) BMW 132J, fitted with the Zusatzeinspritzung (Methyl-Alkohol) liquid cooling unit, in July 1937. This necessitated structural alterations to accommodate the bigger fitments. This power plant drove a three-bladed Junkers (licensed Hamilton) adjustable-pitch metal propeller with a 19.68in (50cm) spinner. Another planned feature, an enclosed cockpit, also failed to materialize. This much-altered aeroplane subsequently featured yet a third engine in October 1937, the 960hp (716kW) BMW 132K V109W (Werke No. 55053), with the engine, beneath a long-chord cowling and driving a Junkers-Hamilton Verstellorpeller three-bladed propeller. This version first flew on 23 October and later joined a Luftwaffe Staffel, but the engine failed in service and once more required a replacement. Further testing at Rechlin followed before, on 12 January 1939, she was finally returned to Luftwaffe charge. The V-6 (Werke No. 797, D-IHDI) was the seventeenth A-1, fitted with a fully enclosed cockpit, which had a sliding hood. She featured an extra pair of machine-guns emplaced beneath the lower wings. The pilot was provided with an armoured headrest and this entailed building up the fuselage immediately aft of the cockpit into a turtleback to attain the necessary height. Both the sliding hood and the armour were incorporated into the A-1. She was trialled with the 910hp (678.5kW) BMW 132J engine and then with the 960hp (716kW) BMW 132K radial, driving a three-bladed, adjustable-pitch Vereingite Deutsche Metall Werke (VDM) hollow-bore propeller. She was scheduled to become the prototype of a proposed C-1 variant, but in the end this was not proceeded with. The V-7 (Werke No. 985, D-IUPO), another from the A-1 batch, was originally scheduled to appear in July 1937. Due to additional requirements, which included an enlarged main internal fuel tank, required so that the auxiliary tank could be done away with and replaced by a mounting for a 551lb (250kg) bomb, she was not completed until September, and even then did not have her intended power plant, which was having teething problems. A temporary main driver, the BMW 132K V100 radial engine (Werke No. 55054) was not delivered until 26 October and the V-7 first flew the following month. However, it was not until June 1938 that the designed engine, the BMW 132 K V110 was fitted and testing commenced at Rechlin with test pilot Hanna Reitsch. This continued through to 5 September when the aircraft was handed over. Two of these prototypes were tragically destroyed within a period of three weeks while undergoing testing at Rechlin. Due to the demanding nature of the designed mission, both disintegrated while attempting to recover after performing high-speed dives and shedding their upper wings in the process. These structural weaknesses led to a strengthening of the centre-section struts in the fourth prototype, the V-4. This appeared to solve the problem and subsequent near-vertical dives and their recovery proceeded without any further tragedies. This fourth prototype therefore provided the basis for all subsequent production but with a modified power plant.